The False Promise of Universal Basic Income? 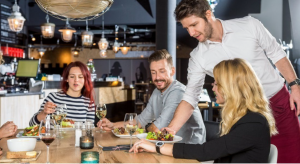 What to Know: The Washington D.C. City Council has introduced a measure to repeal a minimum wage hike for tipped staff – waiters, waitresses, bartenders and such – that voters approved in June. The hike is opposed by many of those tipped staff. DC's Council threatened with political backlash if they repeal Initiative 77. Milton Friedman's version of UBI- The Negative Income Tax, as discussed with William F. Buckley in 1968 episode of "Firing Line".